© 20111-12 CREATIVE INSIGNIA LTD.
Have Class decide the design, shirt colour and print colours. Contact our office & we will forward the selected artwork as well as a complimentary pen for the students to use to sign the design in BLACK. Sizing samples are also available upon request. Return a consolidated order, signed 15 & garment samples. Confirmation of order will be faxed to the school. Student cheques should be payable to the School and we will invoice the School when the completed order is delivered to the School in approx. 3-4 weeks. Please double check order as a request for 1 more shirt after order is complete is very expensive. If you have any questions about our Class/Grad Shirts Program or require information about other products please contact us. 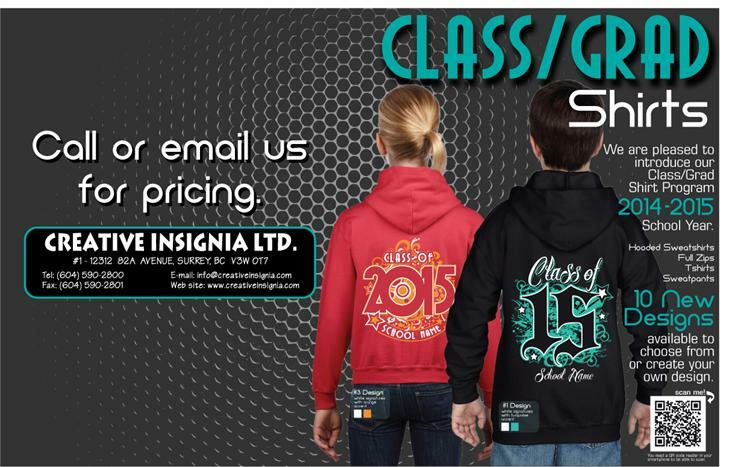 Browse our online Grad/Glass Shirts 2015 flyer by clicking the image.